Sometimes a girl just needs to steal a few hours to herself, and rewind from the stresses of everyday life. Craving an escape from the city, the Moroccan Mint Green Tea Tingler Massage with La Sultane De Saba at Dolphin Spa in Pimlico sounded like the perfect treatment, with promises to help you get beach body ready with the cellulite busting techniques & products! 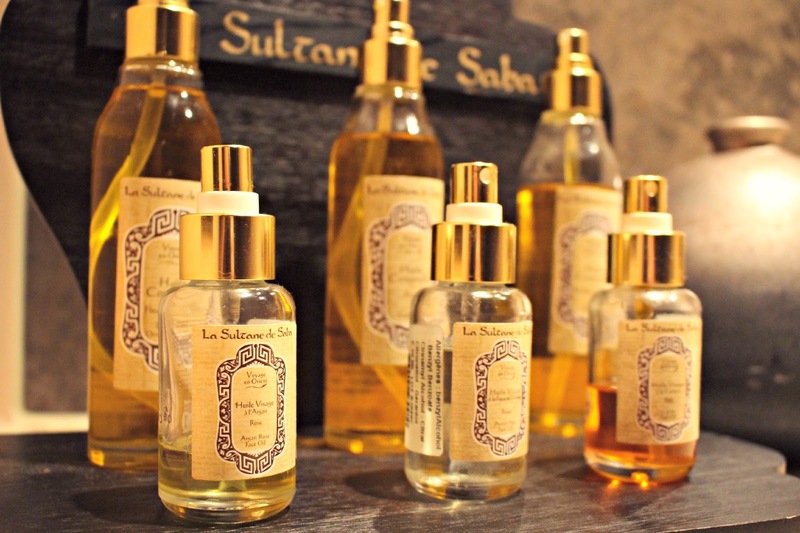 Using natural ingredients with magnificent fragrances and decadent textures, the La Sultane De Saba products enable you to experience a journey of pure relaxation, all without leaving central London. The spa is hidden away in the leisure area of the Dolphin Square apartment complex in Pimlico, and when you find the grand wooden doors hidden down the steps, you find yourself transported into a Moroccan haven, with eucalyptus and incense fragrancing the air, and candles and lamps dimly lighting the gold-tinted rooms and corridors. I was lead through the enchanting reception area to the changing room, where the locker was pre-filled with a robe, flip-flops, and towels for me to use in the spa. After changing and removing my makeup with the cleanser and toner provided, I settled into an enchanting lounge area to wait for my treatment. A traditional Moroccan hand cleanse was performed, using warm rose-water – a ritual that is performed when welcoming someone into your home in Morocco. The water was poured onto my hands from a genie-bottle-esque teapot, into a grand gold basin. I was then lead down a candle-lit corridor, into a dark steam room made entirely of stone. I was directed to place my feet in a bowl of warm water mixed with mint and green tea leaves – supposedly to boost circulation in your extremities. While my feet soaked, I was shown the products that would be used in the first part of the treatment; firstly a La Sultane de Saba salt Green Tea and ginger scrub, then a heated green tea shea butter and body oil, and finally the warm rassoul mud. While laying down on the heated stone in the Hammam stone room, warm water from a fountain in the room was poured over my whole body, before the scrub was applied to the lower half of my body using fast, high-pressure movements designed to boost circulation and banish cellulite from problem areas. The vigorous massage on my legs and tummy wasn’t uncomfortable, but I was still relieved when the actions designed to promote draining and circulation softened to a more traditional massage style. I was then treated to a targeted pressure point massage with the heated green tea and ginger shea butter & oil, which is designed to help skin tone and texture. Finally, the rassoul mud was applied, and I was left to relax in the steamy hammam for 20 minutes. The warm water was used to wash the mud off, before I was directed into a private massage room for the final stage of the treatment. A high pressure massage was performed on each leg, using rapid, high pressure movements with the aim of blasting cellulite and boosting circulation. Each leg was thoroughly pummelled on both sides, before finishing with a more traditional slow massage. The moisturising oil from La Sultane de Saba left my skin feeling silky soft, and smelling lovely, and I was left wrapped in the warm towels while the oils soaked in. Awakening from the spell of relaxation in the massage room, I headed to the relaxation area feeling refreshed, renewed and totally relaxed. I was served traditional Moroccan Peppermint Tea from an ornate gold teapot, along with a snack of almonds and dates to top up on nutrients. Stepping out of the spa into the daylight, even the tube journey home couldn’t awaken me from the zen-light trance that the spa treatment left me in! Thankfully I have a selection of La Sultane de Saba products to take home with me, so that I can relive the ultimate relaxing experience in the comfort of my own home. The La Sultane De Saba Moroccan Mint Green Tea Tingler Treatment* is available at The Dolphin Spa in Pimlico, with prices from £75. La Sultane De Saba products are available here. Previous Post Summer Skin: Battle of the BB Creams!